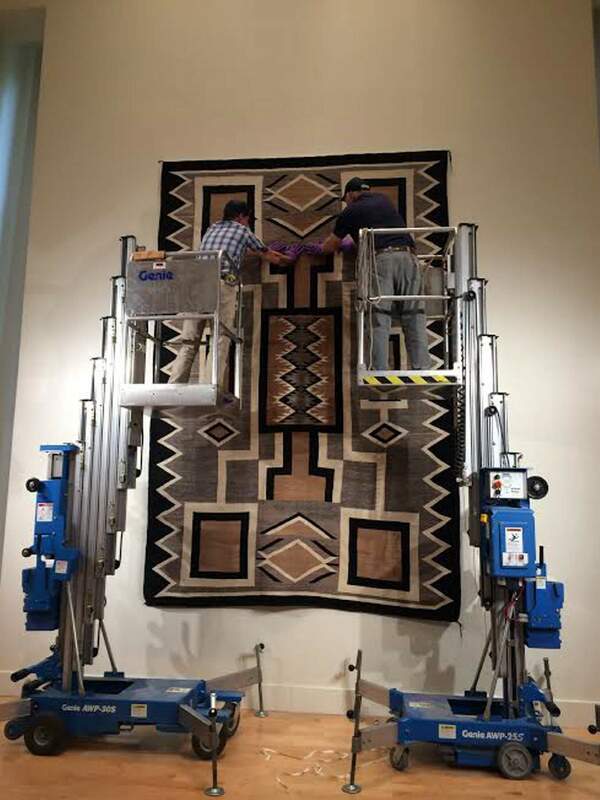 Fort Lewis College Physical Plant employees Howard White, left, and Don Rightsell hang a Two Grey Hills-style storm pattern rug that was donated to Center of Southwest Studies by Edna M. Hughes Spillar..
Center of Southwest Studies opened a new exhibit on June 7. The exhibition, Treasures II: Virtuosity and Variations, is a continuation of the Treasures of the Southwest display that opened in February. Treasures II will be open from 1 to 4 p.m. Monday to Friday. The exhibit will annually feature a selection of textiles from the Southwest, including Native American art, historical photographs, postcards, pottery, sculptures and other works from the archives collection. By rotating artwork from the collection annually, the center will provide the public with the opportunity to see a variety of different pieces, most of which the public has never seen. The exhibition will feature works of art from a multitude of artists including Stanton Engleheart, Gene Kloss, Harrison Begay and Frederick Remington. The exhibit is unique in that it showcases multiple pieces by each individual artist, allowing visitors to examine the evolution and style of featured artists. “Works can be interpreted differently if you see more than one piece that an artist did,” said Jeanne Brako, curator of collections for Center of Southwest Studies. “Either they have a lot of variation in the work, or they work on one theme. They keep doing it over and over again to get it right, or they really progress over their lifetime.”Part of the exhibition will display some of the largest textiles Center of Southwest Studies has in its collection. Center of Southwest Studies typically houses three different exhibits a year. Treasures II will be the main showcase, while Treasures of the Southwest and Ben Nighthorse Campbell: Colorado Renaissance will be on display as well.